The Canadian tar sands have three major new pipeline proposals: Kinder Morgan’s Trans Mountain Expansion, TransCanada’s Keystone XL and Enbridge’s Line 3 expansion. Our new report is written for banks, their institutional shareholders, and for those financial institutions considering financing or arranging finance – through the purchase or underwriting of corporate bonds or shares – the construction and operation of any of the proposed tar sands pipelines. 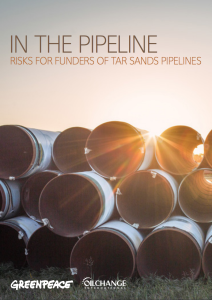 Our report outlines the financial and reputational risks related to all three proposed tar sands pipelines including legal challenges, opposition from Indigenous and local communities, threats to drinking water and economic vulnerability. We make a number of recommendations for potential pipeline financiers and we suggest questions for bank investors to ask to understand whether the various risks are being adequately assessed, mitigated, and managed. Lack of free, prior and informed consent from all Indigenous communities impacted by the pipelines. Negative environmental impacts, including the contamination of drinking water from leaks. Lack of stability in tar sands pipelines’ economic success due to their dependence on tar sands expansion. An undermining of bank and investor action on climate through shortsighted short-term lending decisions. Potential funders should not finance the construction, expansion, or operation of tar sands pipelines in any way. Existing lenders should sell stakes in existing credit facilities used to finance tar sands pipelines, and confirm they will not participate in future credit facilities related to tar sands pipelines. Banks should review exposure to tar sands companies and take steps to align their lending with the ambitions of the Paris Agreement and international agreements on human rights. Institutional investors should engage with investee companies to understand whether the risks of financing tar sands pipelines are being adequately assessed, mitigated, and managed.